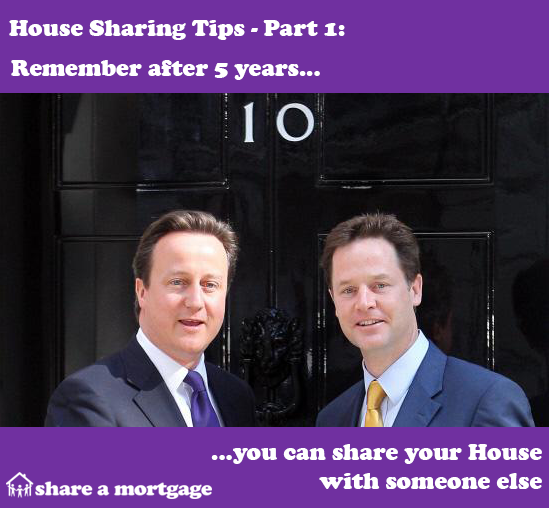 House Sharing Tips Part 1: It's Not Forever! House Sharing Tips Part 1: house sharing with others can sometimes be the best and only realistic way to become property owners. What can put people off is the thought of sharing ownership of a property with other people, whom you may fall out with, and having to stay in the arrangement indefinitely. Mortgage sharing with anyone but your partner should be looked at as an investment in property rather than buying the house you'll spend the rest of your life in. The UK general election of 2010 resulted in a comparable compromise agreement to share 'ownership' of 10 Downing Street. Neither of the Coalition leaders must have relished the idea of sharing No 10 at the outset but neither could have entered the hallowed portal without the other! The first of our house sharing tips series looks at how long a mutually beneficial house share has to last and how sharers can exit the arrangement harmoniously. Join Share a Mortgage to take your first step towards property ownership. Call one of our experts on 0207 112 5388 for more information. You may not have the finances to buy on your own, but by pooling resources with others, centring on deposit funds and the income multiples to make your monthly mortgage repayments, you may be able to get on the housing ladder. You can choose carefully who you share with, either a partner, friend or family member, and then jointly look for a mortgage. To work out what value mortgage you might be able to get, use our mortgage affordability calculator. When you've got your mortgage, you then all look for a house to share. Surely I'd be locked into a house share for a long time? What if it all goes wrong? The 2010 Coalition leaders had a fixed date by which they would have to vacate, 5 years. What many people don't realise is that a house share might run for a similar - and relatively short - time period. The biggest challenge mortgage sharers face initially in a house share is to keep the share together at least for the length of the early repayment charging period. This is normally two years. Sharers can leave a house share before that time expires but a mortgage lender will then impose an early repayment charge. For an averagely-priced UK property, this could be more than £10,000. So our advice is to keep the sharing arrangement at least until the end of the early repayment charging period, barring an emergency! One of the earliest conditions which the Coalition leaders agreed on was to keep the arrangement going for the (5-year) length of the parliament: if seemingly strange bedfellows like David Cameron and Nick Clegg can do this, it surely inspires others! What happens when you get to the end of your initial term? When this Government's initial term expires this May, they will decide what happens next through a general election. You, however, have several options. You can jointly agree to sell - an option with attraction if house prices have risen significantly - and split any capital gains between you. Any sharer can leave the arrangement and be replaced by another person. You can decide between you whether, for example, the other sharers get first refusal on buying the share from the person exiting or selecting the replacement sharer. If the arrangement is proving harmonious and/or if house prices have not risen significantly or even fallen, you could all choose to stay in the house share for a longer period. The previous two options are always open at a later date/should conditions change. The Coalition had an official agreement. Can I get one? The two Coalition parties spent days working out an official agreement which set out the parameters under which the Coalition would work. You can do something very similar. You can draw up a legally-binding agreement before a share starts - or even during a share - to govern matters such as how ownership is calculated, how long a share will last, how anyone can leave and even any agreed house rules. Share a Mortgage offers just such an agreement, called Shared Ownership Protection, specially constructed to protect the individual rights of all sharers in a house share. Sharing a house and a mortgage with others is a great strategy for getting people who can't afford to buy properties on their own onto the housing ladder. This way, sharers can, for example, save money on rent, build up their own equity, leave their parents' houses and get on with achieving life's milestones. Compromise is the key, but it's important to bear in mind that you're not forced into compromising forever, just for long enough to develop your own equity. And you can even draw up a mutual agreement to give you all security. Considering shared home ownership? Call us on 0207 112 5388 or email us at help@shareamortgage.com. House Sharing Tips Part 5: Share with Someone who Creates the Right Environment!